As the Antarctic summer drew to a close in March 2013, sea ice and icebergs floated along the Mawson Coast of East Antarctica. 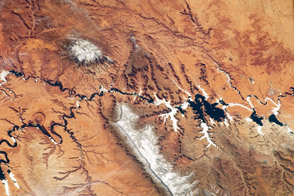 The Moderate Resolution Imaging Spectroradiometer (MODIS) on NASA’s Aqua satellite captured this natural-color image on March 15, 2013. 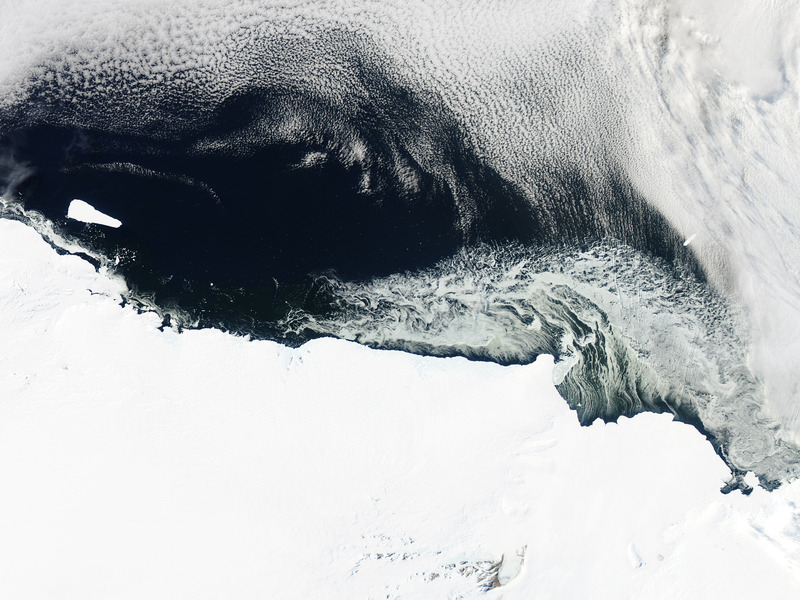 As MODIS acquired this image, a cold wind was blowing off the Amery Ice Shelf, freezing ocean water and creating streamers off the ice shelf edge—a recurring event in this region. Easily pushed by winds and currents, the new, thin ice formed intricate patterns on the sea surface. Icebergs of varying sizes and ages also floated along the coast. The biggest was B-15T, a remnant of a much larger iceberg that formed long ago and far away from the Mawson Coast. B-15 calved off the Ross Ice Shelf, nearly halfway around the continent, in March 2000. Ice shelves are thick slabs of ice attached to the coastline. 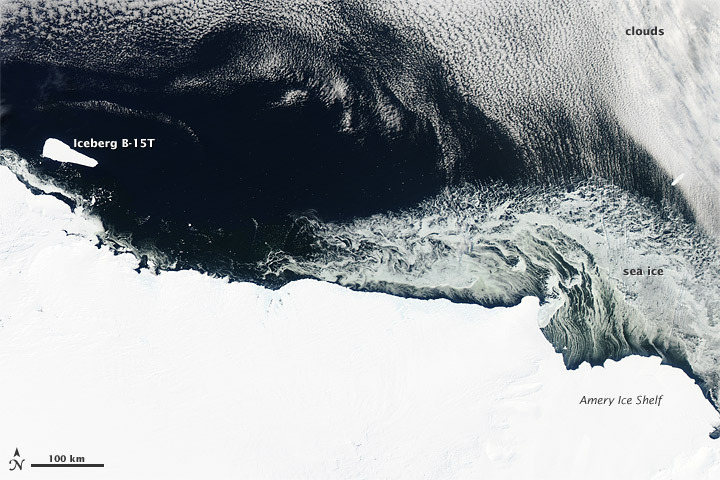 Multiple ice shelves occur along the Antarctic Coast, and chunks are regularly breaking off into icebergs that get caught in the ocean currents and circle the continent for years, as Iceberg B-15T has done. But some icebergs escape those currents and drift northward into warmer waters. 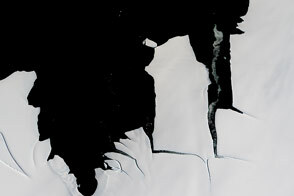 Another remnant of B-15, Iceberg B-15J, drifted north and broke into much smaller pieces in December 2011 and January 2012. 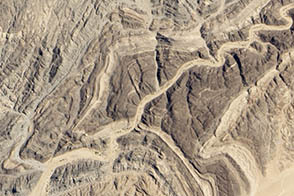 NASA image courtesy Jeff Schmaltz, LANCE MODIS Rapid Response. Caption by Michon Scott with information from Ted Scambos, National Snow and Ice Data Center. 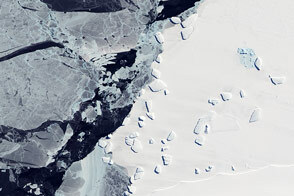 Icebergs and sea ice floated along Antarctica’s Mawson Coast in March 2013. State of the Cryosphere (2010, October 20) Ice Shelves. National Snow and Ice Data Center. Accessed March 20, 2013.